The base for this manicure is, unsurprisingly, OPI My Vampire is Buff. Then, for the floral nails, I freehanded some medium sized flowers on using China Glaze Fade Into Hue and added white centers with Essie Blanc. The remaining negative space was filled up with dots of Zoya Neely. Of course, the glitter nails show one coat of Silly Bee's Chickadees Blueberry Smith Cocktail. This mix of blue and periwinkle glitters is accented by satin green and white glitters. It applied evenly and with nice glitter density... definitely a winner! I love the delicate vintage color palette of this glitter, and I think it translated brilliantly to nail art. Isn't the matchy effect fun? 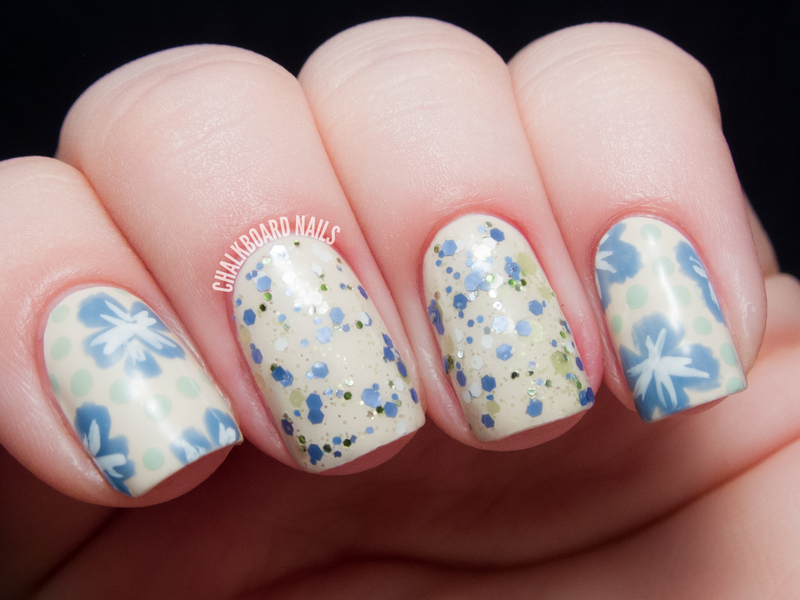 What do you think about these glitter florals? Would you try one out for yourself? Silly Bee's Chickadees polishes are available via Etsy. You can also keep up with the brand on Facebook and Instagram. Blueberry Smith Cocktail is so pretty! The colors match perfectly. This is so girly, I love it! I love the glitter florals idea! Such a great way to use glitter polish, I must try it myself. Love how delicate your nails look with this nail art. I'm not sure how I have missed Silly Bee's Chickadees! I'm on Etsy (I'm a seller but not polish) and blogs all the time! After I saw this post, I bought 4 bottles and just bought the entire holiday collection. I can't WAIT to get the holiday polishes, they look amazing. 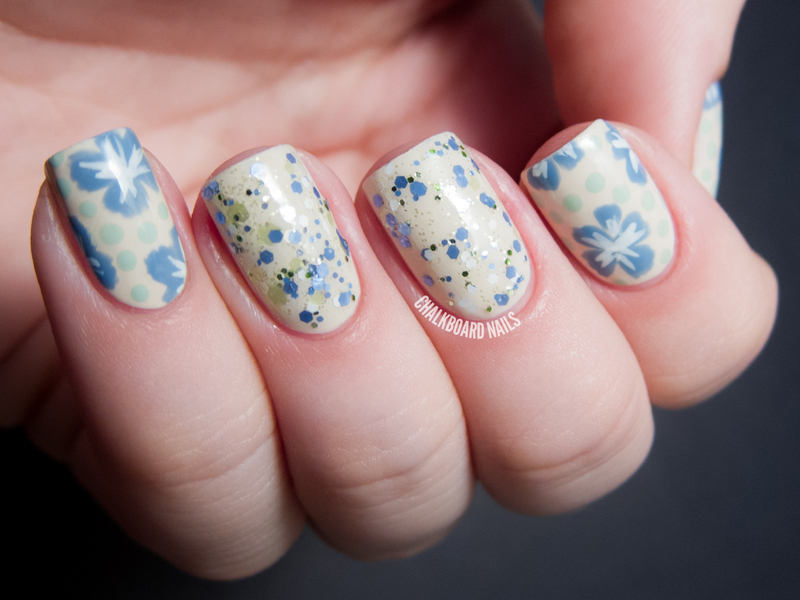 This mani is so beautiful. I really wish I had your freehand skills!